Andrew Como Canalway Trail/Holley Canal Falls Trail; 1.3 mile Loop (1.5 mile Loop from the Canalway Trail). Difficulty: Canalway Trail; Rochester-Buffalo; Easy. Stone-dust and paved trail. Some on-road sections. Spencerport Heritage Trail; Easy. Paved and stone-dust trail. Andrew Como Canalway Trail/Holley Canal Falls Trail; Moderate. Paved, crushed gravel with a steep hill. Medina Riverwalk; Easy. Red paving stone path. Lockport Loop; Easy. Paved & stone-dust trails w/short on-road section. Gateway Harbor Canalway Trail; Easy. Paved, brick and cement. To start from Genesee Valley Park; South (Rochester); From I-390 take exit 16 (westbound) or 16A (eastbound) to East River Rd heading west. Travel through the traffic circle and take your first right into Genesee Valley Park; South. Keep right at the first two intersections. Cross a bridge over a river and park underneath the highway. Follow the trail left then right to a concrete pedestrian bridge over the canal. This brings you to Genesee Valley Park; North and the Erie Canalway Trail. Right takes you along the Erie Canalway Trail; Syracuse-Rochester. Head straight along the Erie Canalway Trail; Rochester-Buffalo to an intersection next to another pedestrian bridge. The Erie Canalway Trail; Rochester-Buffalo continues left on the bridge over the Genesee River. Straight takes you along the Genesee Riverway Trail; West Side. Cross the Genesee Valley Park; West-North Bridge over the Genesee River to Genesee Valley Park; West. This brings you to the Genesee Riverway Trail; West Side and Erie Canalway Trail; Rochester-Buffalo junction. Head left as both trails share this section. You quickly come to a junction and map board. This is where the Genesee Valley Greenway begins. To start from the Henpeck Park parking lot Union Street parking lot (Spencerport); From the intersection of I-490 take the exit for Route 531 west. Travel about 4.5 miles and exit onto Route 259 north. Cross over the canal in Spencerport and turn right into the parking lot. To start from the Canal Park parking lot (Holley); From the junction of Routes 31 and 237 in Holley travel east on E Albion St, then left on East Ave. Just before the canal turn right into Canal Park. To start from the Prospect Ave parking lot (Medina); From the junction of Routes 31 and 63 in Medina head north on Route 63 (Main St). Turn right on Prospect Ave and cross over the canal. The parking lot is on your right. To start from the North Canal Road parking lot (Lockport); From the junction of Routes 31 and 78 in Lockport follow Route 78 north for 1.9 miles. Turn right on Old Niagara Rd, then left on N Canal Rd. First right into the parking lot. To start from the State Street parking lot (Lockport); From the junction of Routes 31 and 78 in Lockport travel south on Route 78 and turn right on State St. Cross Stevens/W High Streets and the parking lot will be on your right. To start from the Ellicott Creek Park/Ellicott Creek Trailway parking lot (Tonawanda); FromI-290 take exit 3 to Route 62 north. Travel 1.4 miles crossing over Ellicott Creek and turning left into the park. Travel through the park towards Creekside Dr. Park before Creekside Dr as there is no parking where the two trails meet. To start from the Unity Island parking lot (Buffalo); From here you may also access the Scajaquada Creek Bike Path. From I-190 northbound take exit 12 to Niagara St and head right. Travel underneath the RR bridge and turn right next to a sign reading "Squaw Island Park". A ramp takes you up to a RR/car bridge and out to Unity Island. Follow the road straight and you'll come to the parking lot. From I-190 southbound take exit 14 to Niagara St and head right. Travel 1 mile, passing underneath a RR bridge and turn right next to a sign reading "Squaw Island Park". A ramp takes you up to a RR/car bridge and out to Unity Island. Follow the road straight and you'll come to the parking lot. To start from the La Salle Park parking lot (Buffalo); From I-190 take exit 9 to Porter Ave and turn right. Follow to Amvets Dr and into the park. This section of the Erie Canalway Trail travels from Rochester to Buffalo. The Buffalo to Tonawanda section utilizes the Shoreline Trail . Starting from Genesee Valley Park; North (northern side of canal) in Rochester; From the junction of the Genesee Riverway Trail; East Side and Erie Canalway Trail; Syracuse-Rochester on the east side of the Genesee River [Mile 40.3], cross the Genesee Valley Park; West-North Bridge over the Genesee River to Genesee Valley Park; West. Note; Continuing mileage from the Erie Canalway Trail; Syracuse-Rochester section. This brings you to the Genesee Riverway Trail; West Side and Erie Canalway Trail; Rochester-Buffalo junction. Head left as both trails share this section. You quickly come to a junction and map board. This is where the Genesee Valley Greenway begins. All three combined trails then continue left crossing over the Erie Canal via a pedestrian bridge. Look right to spot an old RR bridge. Left to see the confluence of the Erie Canal and Genesee River. You then come to another intersection just below I-390 at 40.7 miles. The Erie Canalway Trail; Rochester-Buffalo continues right. The paved Erie Canalway Trail heads west out alongside the southern side of the Erie Canal passing by a spur trail left up to Route 383 (Scottsville Rd) and following a very industrial corridor. I haven't checked out this section. At 41.4 miles you'll pass by an old RR trestle across the canal before traveling underneath Brooks Ave at 41.7 miles. Travel across some RR tracks before a cross-light takes you over Chili Ave at 42.5 miles. Next a bridge takes you over some RR tracks before a cross-walk takes you over Route 33 at 43.3 miles. Travel underneath I-490 and across Route 31 (cross-walk) at 43.8 miles. The trail passes by some defunct RR tracks and bridges (I believe from an old Trolley Line) before traveling underneath Route 154 and Route 390 at 45.1 miles. Note; A spur trail on your left leads to Trolley Blvd. Come to the Route 136 bridge and a spur trail on your left at 46.2 miles. Note; Continuing straight underneath the Route 136 bridge the trail reverts to stone-dust and ends after 1.4 miles at Allen's Canalside Marine. Head left following the spur trail up to Route 136. Head right utilizing a sidewalk across the bridge where you will pick up the paved trail on your right. This will take you back alongside the canal and underneath the Route 136 bridge where the stone-dust Canalway Trail continues west along the northern side of the canal. Here the canal is more isolated. You pass by the Henpeck Park parking lot (Porto-potty & boat dock located here) before traveling underneath Route 158 at 48.4 miles. Pass by a boat dock and spur trail for GREECE CANAL PARK at 48.7 miles. Travel underneath Route 208 at 49.5 miles and Route 210 at 50.6 miles before passing by a canal Guard Gate. As you enter Spencerport you pass through Towpath Park, where the trail is paved, out Union St. Head right for a crosswalk and this will bring you to the Union Street parking lot at 52.1 miles. Map board located here. Note; From here you can check out the Spencerport Riverwalk. I've checked out this section. Cross the Union St bridge to downtown Spencerville. Look for a cement passageway on your left between two buildings. This leads to the paved Spencerport Riverwalk. Travel past a canal dock and the SPENCERPORT DEPOT & CANAL MUSEUM . The paved trail turns to stone-dust. This open trail continues east alongside the canal passing by picnic tables and a dock before turning south and ending after 1.1 miles. A parking lot is located near the dock and can be accessed off of Lyell Ave. Continuing along the paved Canalway Trail after traveling underneath the Martha St bridge at 52.2 miles the trail reverts to stone-dust again. The trail now travels between the canal and Canal Rd, passing underneath Trimmer Rd and crossing Route 212 (crosswalk) at 55 miles. As you approach the Gallup Rd bridge at 56 miles the trail becomes paved for a short distance and isolated again as you lose Canal Rd. Travel underneath Route 260 at 57.4 miles and across Fayette St at 59.5 miles. Here the trail is brick lined in the town of Brockport. Cross over to the Main Street parking lot at 59.6 where you'll find a map board. Trail reverts to stone-dust. Travel underneath the Smith St bridge and across a small spillway before passing by another Guard Gate at 60.5 miles. Travel underneath Route 31 twice before coming to the Sans Souci Park parking lot at 62.8 miles where you'll find a map board, picnic pavilion and Porto-potty. Travel underneath Bennetts Corners Rd at 63.7 miles before coming to East Ave at 64.2 miles. Note; From here you can check out the Andrew Como Canalway Trail/Holley Canal Falls Trail. I've checked out this section. Cross the canal via the East Ave bridge and turn left along East Ave where you'll find Canal Park. A boat launch and pavilion located here. Head right along the wide, paved Andrew Como Canalway Trail. This takes you inland past a small pond, picnic pavilion and playground. Come to an intersection at 0.3 miles. Note; Straight takes you up to Geddes St where you can check out the old 1907 Holley RR Depot. Head left down the gravel Holley Canal Falls Trail which leads to the Holley Canal Falls parking lot at 0.5 miles. Here your treated to a beautiful man-made waterfall. The Holley Canal Falls are a result of a Waste Weir off the Erie Canal. Excess water from the canal was diverted into East Branch Sandy Creek, dropping 40 feet along the way. Cross the bridge and head right past the pavilion along a crushed gravel trail. A steep climb takes you up to an intersection. Note; Right the trail leads out to State St. Head left and the trail splits. Keep left and you'll travel above the falls, alongside East Branch Sandy Creek and out to a 3-way intersection at 1 mile. The Waste Weir is straight ahead. Note; Hard right leads 0.3 miles to State St, right leads 0.2 miles to Bennetts Corners Rd. Head left where the trail travels west alongside the canal before becoming paved as you pass by a dock before returning to Canal Park for a 1.3 mile loop (1.5 mile loop from the Canalway Trail). Continuing west along the stone-dust Canalway Trail you travel underneath the Route 237 bridge at 64.9 miles, Route 54 at 65.7 miles and Groth Rd at 66.2 miles before crossing Route 24 in the town of Hulberton at 67.3 miles. The trail briefly utilizes Canal Rd before continuing west alongside the canal. Travel underneath Route 387 at 68.7 miles, past the old Hindsburg bridge at 69.4 miles, underneath Route 64 at 69.9 miles, Route 11 bridge at 70.9 miles, Keitel Rd bridge at 71.6 miles, Butts Rd bridge at 72.5 miles and Brown St bridge at 73.1 miles before crossing Ingersoll St at 73.7 miles in Albion. The trail then utilizes a road out to Main St past which the trail returns to stone-dust. You travel underneath a steel bridge before passing by a Guard Gate at 75 miles. Travel underneath Route 86 before crossing Route 21 at 77.2 miles. Here you'll need to continue straight along Eagle Harbor-Knowlesville Road where you'll pick up the trail next to a Parking lot. Travel underneath Allens Bridge Rd at 77.9 miles, Presbyterian Rd bridge at 78.5 miles and Route 10 at 80.3 miles where you pass through Knowlesville. At 81.8 miles The Culvert Rd passes below the trail and the canal through a tunnel. Built in 1823 it's the only road to travel underneath the Erie Canal. Travel underneath Beals Rd before coming to Bates Rd where you must travel up and across to an access road for a boat launch and parking lot at 83.5 miles. Here you'll find another Guard Gate. You'll pass by the Horan Road parking lot at 84.1 miles before traveling underneath Horan Rd, past a map board and coming to a cement causeway in Medina at 84.4 miles. Here the rough cement trail takes you across then above Old Orchard Creek. If you look right you can see the Medina Falls. Spillway into the creek located across the canal. Travel underneath the Glenwood Ave bridge before passing by a giant apple sculpture and crossing Prospect Ave at 85 miles where you'll find a parking lot. Note: From here you can access the Medina Riverwalk. I've checked out this section. Cross the Prospect Ave bridge and turn left along the Medina Riverwalk which consists of red paving stones. Travel alongside the canal and along a narrow catwalk underneath the Glenwood Ave bridge. Briefly follow an access road before returning to pavers. Come to a map board, gazebo and dock after 0.5 miles. Trail ends here. Continuing west you'll pass by the small Prospect Ave parking lot before rejoining the stone-dust Canalway Trail. Travel underneath the Marshall Rd bridge at 86.6 miles, passing by a Guard Gate at 88.2 miles and coming to Front St where you briefly share the road out to Main St in Middleport at 89.7 miles. Cross Main St and continue along the canal traveling underneath the Carmen Rd bridge at 90.5 miles, the Root Rd bridge at 93.4 miles and crossing a sluiceway over East Branch 18 Mile Creek at 94.3 miles. After passing by a Guard Gate you cross Route 103 in Gasport at 95.1 miles. Small parking lot and map board located here. Travel underneath the Orangeport Rd bridge at 96.1 miles and N Canal Rd bridge at 98 miles before passing by the N Canal Road parking lot and traveling underneath the Day Rd bridge at 98.9 miles. You pass by a second North Canal Road parking lot (map board) before traveling underneath the Cold Springs Rd bridge at 99.9 miles. Note: From here you may complete a nice loop up to Lockport, then back along the southern side of the canal returning to the North Canal Road parking lot. I've checked out this section. Continuing west along the stone-dust Canalway Trail you travel underneath the Lake Ave bridge as you enter Lockport, past the closed Adam St bridge and past the Mill St bridge where you briefly share an access road before crossing 18 Mile Creek and coming to a detour around the Canal Lockport Shop at 101.1 miles. Pass by a dry dock and return to Canalway Trail which shares a paved access road. Travel past some old ruins on your right then underneath a high RR bridge before coming to the start of the old Flight of Five Locks and Locks 34 & 35 in Lockport at 101.6 miles. The 60 foot rise in the Niagara Escarpment presented a major engineering problem during the construction of the original Erie Canal (1817-25). It was solved by Nathan S. Roberts, who designed a double set of five combined locks; one for ascending traffic heading west and another for descending traffic heading east. Each lock was 90 x 15 feet and had a lift of 12 feet. The first enlargement of the Erie Canal took place between the years 1835 and 1862. At this time, the canal prism was extended and the locks at Lockport were increased from their original size to 110 feet x 18 feet. This allowed an increase in the tonnage of canal boats from seventy-five to two-hundred-forty. From the years 1909 to 1918, the Erie Canal was modified to become the New York State Barge Canal. The southern tier of the locks at Lockport were removed, and in their place was constructed a set of two electric lift locks [Locks 34 & 35]. These concrete locks with steel gates were 310 feet x 45 feet x 12 feet, and had a combined lift of 49 feet. The water gates of the northern tier of locks were removed so the locks could be used for the passage of surplus water. The Canalway Trail travels up alongside the old Flight of Five Locks with lots of informational signs and a small museum located between the two locks before bringing you to Canal St. Note; If you head right between the two stone buildings and look across the parking lot you'll spot an 1843 stone canal building which now hosts the ERIE CANAL DISCOVERY CENTER . Follow Canal St out to the junction of Cottage, Church and Niagara Streets at 101.9 miles. Note; From here you may loop back to the North Canal Road parking lot along the southern side of the canal. Head left on Cottage St over the canal, then left up Main St (sidewalk available). Pass by the huge old marble Lockport Exchange building. Turn left down Market St and you'll pick up a paved trail along the left as you travel underneath the RR bridge at 0.5 miles. You travel by Scalzo Park, LOCKPORT LOCKS & ERIE CANAL CRUISES and an old stone building before coming to the Josephine Carveth Packet Park. Here the trail winds along the canal through shade trees. Pass a gazebo and cross Mill St where a boardwalk briefly travels along the canal. Pass by the old Adams St bridge at 1 mile. Travel underneath the Lake Ave bridge and through Nelson Gohele Park before coming to Widewaters Marina parking lot at 1.8 miles. Travel on-road up Market St to Cold Springs Rd and head left across the canal. Turn right on N Canal Rd then right into the North Canal Road parking lot after 2.5 miles (4.5 mile Loop). Note; An on-road detour is required to access the next paved section of the Canalway Trail from the junction of State Rd & Stevens St.
Travel straight along Niagara St (Bike Sharrows) for 0.3 miles and turn left down Prospect St where you'll find a Bike Lane. Turn left when you come to Stevens St and cross over the Erie Canal via a Bike Lane or a sidewalk. This brings you to State St where you'll pick up the paved Canalway Trail after 0.8 miles. The trail travels south along State St bringing you to the State Street parking lot at 102.8 miles. Map board located here. The trail travels south between State St and the canal along an open corridor. The canal is mostly obscured. You cross State Rd and Route 93 at 103.9 mile (Crosswalk; Caution high speed traffic) before crossing Robinson Rd. 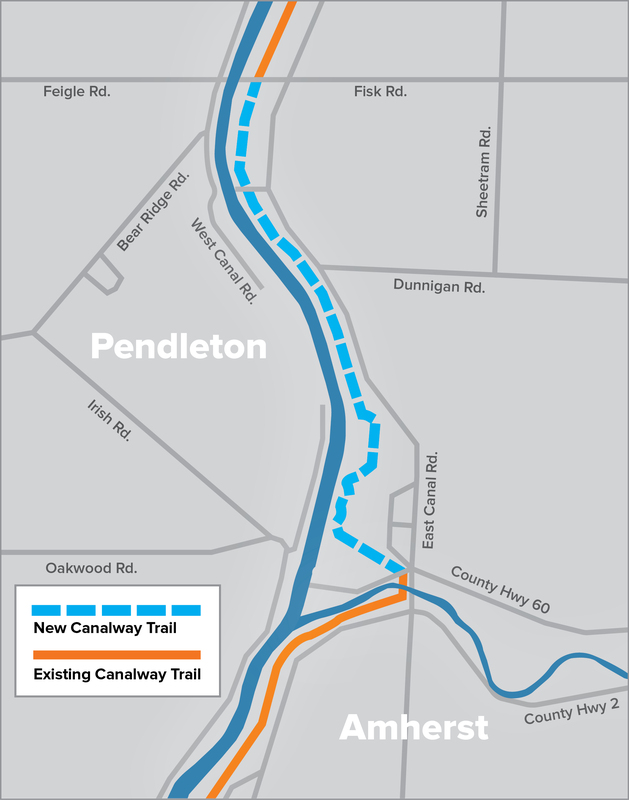 Note; From here you can access the Pendleton Rail Trail by heading left over the canal to Lockport Rd and traveling on-road (wide shoulder) 0.7 miles to the start of the paved Pendleton Rail Trail on your left. I haven't checked out this section. Across Robinson Rd you'll pass by the East Canal parking lot at 105.5 miles. Map board located here. Continuing south the trail travels between the canal and E Canal Rd. Look right to spot a Guard Gaten across the canal. Cross a bridge and you'll come to the Fisk Road parking lot (gravel) after 106.9 miles. Note; A 2 mile gap is currently under construction between Fisk and Tonawanda Creek roads. Slated to be completed by 2019. Head left on Fisk Rd, then travel right (south) on-road along E Canal Rd (wide shoulder) for 2 miles to Tonawanda Creek Rd. Continue straight to a pedestrian bridge over Tonawanda Creek next to New Rd where you’ll return to the Canalway Trail at 109 miles. Here the paved trail follows Tonawanda Creek. Pass by a spur trail at 109.2 miles that leads to Tonawanda Creek Rd. Note; Across the road is a parking lot for the BUFFALO NIAGARA HERITAGE VILLAGE . The creek and canal merge and the trail continues south along the canal. Come to Orbit Dr at 110 miles. Follow Orbit Dr right (south) on-road (residential) for 0.4 miles and you’ll pick up the paved trail just before Tonawanda Creek Rd. The trail now parallels Tonawanda Creek Rd heading west crossing an iron bridge over Ransom Creek and passing by a small parking area and picnic spot at 111 miles. Come to an intersection at 111.9 miles. Note; Straight leads to the Duane Rodke Memorial Park parking lot. Head right around the park and underneath the Route 270 bridge then back out to Tonawanda Creek Rd at 112.2 miles. Head right on-road (bike lane) following Tonawanda Creek Rd for 0.8 miles before picking the trail on your right. Travel underneath Bear Ridge Rd before coming to Brenon Rd at 113.8 miles. Head right for a short on-road (residential) section before rejoining the trail on your right. Here the trail passes by the University at Buffalo Boathouse before jutting south around Amherst Veterans Canal Park and traveling between the canal and Tonawanda Creek Rd. The trail abruptly ends at 115 miles. Head right on-road along Tonawanda Creek Rd inland for 1.3 miles, crossing busy Route 62, before picking up the paved trail at 116.3 miles. The trail continues south between the canal and Old Niagara Falls Blvd. Travel underneath the E Robinson Rd bridge before passing by the Ellicott Island Bark Park parking lot at 117 miles (a bridge leads over to this dog walking island). The trail now travels between the canal and Creekside Dr. You'll pass by multiple parking lots. The trail abruptly ends at 118.1 miles next to Creekside Dr. Note; Across Creekside Dr is the entrance to Ellicott Creek Park and the start of the Ellicott Creek Trailway . Parking available. Head right on-road along Creekside Dr (shoulder available) for 1 mile before picking up the paved trail on your right. The trail now travels west between the canal and E Niagara St. Travel underneath the Route 425 bridge at 119.6 miles, pass by E Niagara Street parking lot #1, then underneath a RR bridge, past E Niagara Street parking lot #2, underneath the Route 384 bridge and across an iron trestle bridge over Ellicott Creek. Note; Across Young St to your left is the Tonawanda Blue and Greenways Intermodal Hub. Parking, picnic tables and restrooms for bikers, hikers and canal users. Head right to the intersection of Main, Niagara & Young streets in Tonawanda at 120.5 miles. Tonawanda Gateway Harbor on your right. Note; From here you can access the Gateway Harbor Canalway Trail. I've checked out this section. Head right on Main St/Webster St across the canal to Sweeny St and head right. A wide cement path takes you above the canal and through an pavilion (rest rooms). Cross Main St, then turn right through a parking lot to a brick lined trail along the canal. Travel underneath a RR bridge where you pick up a wide paved trail at 0.4 miles. Trail meanders alongside the canal before turning out to Sweeney St at 0.7 miles where a bike lane continues east ending at Division St after 1 mile. Note; From here the Erie Canalway Trail utilizes the Shoreline Trail south to Canalside in downtown Buffalo. Cross Main St where the trail follows a wide sidewalk. Pick up the paved trail on your right just before Seymour St. Travel underneath Seymour St and back alongside the canal. Pass by an old RR turn bridge out in the middle of the canal before coming to the juncture of the Niagara River, the Erie Canal and Ellicott Creek at 120.9 miles. Across the river is Tonawanda Island. The trail now travels south alongside the Niagara River entering Niawanda Park which contains multiple parking lots, a boat launch, dock, band shell and restrooms at 121.2 miles. Across the river is Grand Island. Just past the final Niawanda Park parking lot and before you cross a bridge over Two Mile Creek at 122.4 miles will be a map board. Note; This is the start for the Two Mile Creek Greenway which travels out across Niagara St and alongside Two Mile Creek. I haven't checked out this section. After you cross the bridge and creek you enter Isle View Park. Multiple parking lots, boat launch, dock, picnic tables and gazebos. You exit the park at 123.7 miles where the trail follows River Rd south. You travel underneath the I-190 bridge and the trail continues alongside River Rd, away from the river. Very industrial corridor. Travel underneath a RR bridge and the trail soon comes alongside the river and I-190 next to Stingers Marina at 126.7 miles. Here the trail travels just below I-190 and above the Niagara River. At mile 127.5 you pass by a pedestrian bridge over I-190 that leads to Riverside Park. Next you'll pass through Black Rock Canal Park containing several parking lots at 127.9 miles. Follow Aqua Lane out of the park and underneath an exit ramp for I-190 where the paved trail continues on your right. The trail takes you around Harbor Place Marine just below I-190. Turn right then left across Hertel Ave to return to the trail. Note; Right down Hertel Ave brings you to Tow Path Park. Looking south you'll spot Unity Island and the Black Rock Canal. Cross Austin St where the trail continues below I-190. Cross Hamilton St where the trail utilizes Dann St briefly as you pass by Black Rock Lock. A ramp then takes you up and over I-190 and out to Niagara St. Head right up a ramp to an intersection at 129.3 miles. Note; From here you can access the start of the Jesse Kregal Pathway which follows Scajaquada Creek out to Delaware Park. Just head right underneath the RR/car bridge. Continue straight up to and across the RR/car bridge where you'll cross over Black Rock Canal to Unity Island. The trail cuts west across the Island next to the RR tracks before crossing the access road and traveling underneath the International RR Bridge which crosses the river to Canada. Note; Before you cross the access road there are some paved trails on your right that will bring you to the northern tip of the island where you can check out Black Rock Lock. A stone pier leads to the canal's end where it enters the Niagara River. About 0.6 miles one-way to the end of the pier. I haven't checked out this section. You pass by the Unity Island parking lot at 129.7 miles before coming alongside the Niagara River. Here the trail travel south alongside the river and past the sewage treatment plant. The trail brings you to Broderick Park at 130.8 miles. Note; Continue straight to check out the park and Bird Island Pier, which forms the stone break for the Black Rock Canal. The pier is a 4' walkway atop the stone break that travels 1.2 miles traveling underneath the Peace Bridge. Head left on-road along Robert Rich Way, across the canal, underneath I-190 and out to Niagara St at 130.9 miles. Head right on-road (sidewalk available) for 0.5 miles, bearing right on Busti Ave and you'll pick up a wide sidewalk on your right across from Hampshire St. The trail then becomes paved and travels underneath the Peace Bridge. Head down a ramp to a pedestrian bridge that crosses over some RR tracks then takes you underneath I-190 where the trail now travels south back alongside Black Rock Canal at roughly 131.7 miles. Pass by the West Side Rowing Club and Frank Lloyd Wright's Fontana Boathouse before heading right alongside Porter Ave and passing by the Buffalo Yacht Club. Here the trail again travels alongside the Black Rock Canal and enters La Salle Park at 132.7 miles. Parking located here. I've checked out this section. You follow alongside Amvets Dr before heading inland across a field. To your right is the entrance to the Black Rock Canal. Cross Lakefront Blvd where the trail travels alongside some RR tracks just below I-190 before taking you back out to Lakefront Blvd. Head left and you'll come to Erie St at 134 miles. Cross Lakefront Blvd to a sidewalk following Erie St across Wilkeson Way to Marine Dr on your left. Head left along Marine Dr (bike lane) passing by Veterans Park and the ships & planes of the BUFFALO & ERIE COUNTY NAVEL & MILITARY PARK . If you use the paved path through this park please walk your bike, as the trail is narrow and crowded with pedestrians. When you reach the large submarine top head right across a wide cement patio followed by a wide brick lined patio. This leads to a Bowstring Truss Bridge over the Commercial Slip to CANALSIDE at 134.4 miles in downtown Buffalo. This is the official start of the Erie Canalway Trail. To your left next to the Commercial Slip is the excavation site of the original Steamship Hotel building foundations, which are presented alongside several interpretive exhibits showcasing the historical significance of the Erie Canal. Across Marine Dr you'll find Canals with a freezing system that were built to replicate historic canals. The canals have water in the spring and summer and ice in the winter for skating and ice biking. To the south is HarborCenter and First Niagara Center. You may also rent bikes at BLUE BIKE RENTAL . Note; The Shoreline Trail; West Side continues along the Outer Harbor across the Buffalo River via a Bike Ferry. The ferry docks across the pedestrian bridge next to the Commercial Slip. See; QUEEN CITY BIKE FERRY for hours and fees. See: Shoreline Trail . Note; To access the Shoreline Trail; East Side travel south through Canalside along the boardwalk next to the Buffalo River and underneath Route 5. See: Shoreline Trail; Outer Harbor Section.